This book has appeal for young children and is fun to read. 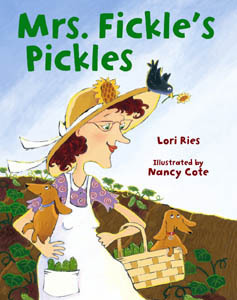 The two dachshunds and the little bird that appear on the jacket and throughout the book, in addition to the the repetitive line "Mrs. Fickle likes her pickles," draw children to follow the story. The gouache illustrations are not masterpieces, but they are good and the colors are eye-catching. The calendar on the wall helps to explain the timeframe for growing a garden. Mrs. Fickle is younger than most characters in books about gardening, affirming that young people can be gardeners, too. This offbeat ode to pickle-making madness is also a sprightly brief on the down-to-earth rewards of planting your own garden and enjoying the fruits — and vegetables — of your labor. 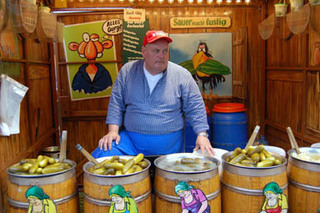 Ries follows a pickle grower step-by-step from buying the seed to eating the pickles she loves. A simple 16-line poem comprises the entire text, and every other line reads exactly the same-"Mrs. Fickle likes her pickles"-a device sure to spark audience response. Cote's bright illustrations, done in gouache, carry much of the narrative, which begins with Mrs. Fickle buying seeds at a quaint garden shop. With a perpetual smile on her face, she plants and nurtures her nascent pickles, watched by two eager dogs and a bluebird that often perches atop her hat. She measures the height of the plants in her plethora of pots, and transfers them into neat rows in her back yard. Then she packs them in jars, and drives them to the county fair (in a pickle green convertible, naturally). Her pickles win a blue ribbon and she comes home to where she loves them best: "sitting on her tongue." The illustrations are captivating. The story line captures a part of American culture that is rapidly dying. The rhymes are soothing and allow the reader to anticipate what comes next. It is truly a fun book for adults and kids- lots of visual stimuli to capture the listener. I loved it. Mrs. Fickle likes her pickles! It’s a chorus sure to be repeated in this high energy read aloud that follows Mrs. Fickle’s pickles from seed to pot to garden to jar to county fair (in her pickle green convertible, naturally!) You’ll lick your lips with anticipation- will Mrs. Fickle’s Pickles win the blue ribbon? A crunchy new favorite for ages 4-8. Single sentence rhythmic pattern follow Mrs. Fickle's quest in cultivating her pickles for the county fair. From seed to canning readers follow the sequence of events as each action is decribed in prose. 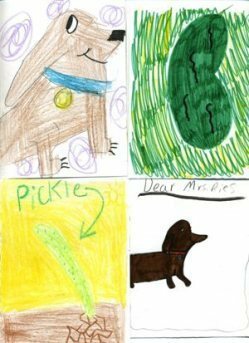 The vivid illustrations reinforce this sixteen sentence poem of Mrs, Fickle's much-loved pickles. The book is perfect for read alouds and to illustrate the germination process of a pickle seed. It is ideal for its intended audience. This is a very cute book for the very young. The words are easy and rhyming, and actually the illustrations tell more of the story. They give more details that a parent or teacher could then stop and and share with the listenrs. Such details include gardening information, etc. Children will notice and like Mrs. Fickle's pet dogs and bird, too.